Have you ever thought about the things that really gross you out? Just sat for a moment and listed them out for full contemplation? Well, I’m telling you now that you should. 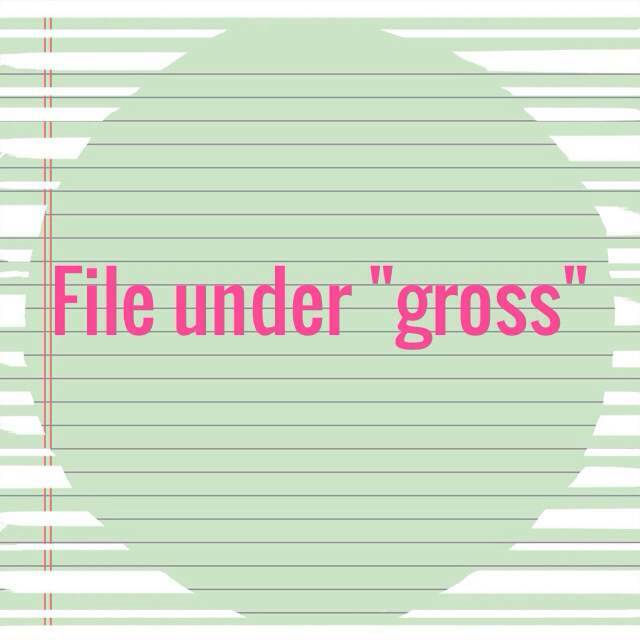 Because when I put this list of gross together (don’t worry I don’t get too specific with the details), I realized that some of these things most likely aren’t considered gross by others. Nope, some are just quirkily gross to me. So take a look…here, in no particular order, here are nine things I get all blegh about. Sharing a banana. Admittedly this sounds weird. But what I mean is, you take a bite of a banana and then I take a bite of that same banana. This will never happen. Cooked celery. Listen, I know celery makes up one-third of the holy trinity of cuisine but when cooked, it’s gross. Bare foot assault. The person sitting in the row behind you on the plane who shoves her bare foot between the seam of your seat and that of your seat mate. You look down to figure out what’s poking the back of your arm and you see someone’s horrible-looking, un-pedicured toes…just there…invading your space. Never happened to you? No? Well, I’m very glad for you. Kale chips. There’s nothing more to say, really. Stinky workout equipment. Because it means other people’s sweat has seeped into that mat/shoulder press/dumbbell weight, etc. and now I’m smelling it and touching it. Oh goodie. Anyone spitting. Especially after making a loud – with significant effort – hoarking sound. Gross. Too much perfume/cologne. Scent-dripping people…when you spritz douse yourself in your fav scent each morning, if it takes longer than one second to apply the scent…you’re wearing too much! Maggots in the green bin. Doesn’t matter how much you keep the bin clean, come summertime those maggots. Take. Over. This is why I am suddenly very busy any time food waste needs to be taken out to the green bin – particularly on a hot summer’s day. Ha. There it is. My list of gross. What would you take off or add to this list? Spitting, I cannot handle spitting. The child seems to enjoy spitting and certainly enjoys my reaction to her doing it. Yep – it really is gross. There is no age when spitting is cute. 1. Bananas, shared or not, have a nasty texture – make it into bread or muffins and we’re good. 2. Celery is gross – but can be made to disappear into some dishes. Raw in a salad gets it tossed in your eye. 4. Feet. Oh… the nasty feet. Keep your freakin’ feet to yourself! Don’t F’n touch me with your feet. *I* may, of course, warm up my feet on your side of the bed. 5. I like kale chips – I make ’em. 6. Home gym and treadmill. Really should use them. 8. Ah…. high school. I say take an AXE to them! 9. Our green bin has never had maggots – we use it all year long. You’re obviously defective. I like liver – mom makes it for me cause no one else in my family will eat it. It’s a treat! LOL – Nancy, tell me your green bin tips…I need to know! Would love to add more gross stuff to this list, but am to busy SHUDDERING IN HORROR. Alcohol will definitely be required to get over the maggot thoughts before bedtime. BLEH. Stef – ha! Too funny.